I'm not a very organized person. One look at my desk will show you that. Have another pop, why don't ya! Surprisingly, when I had a car, it was always clean. I keep my wife's car clean. My desk at work (though I am rarely there) is clean. I fold all the laundry, take out the garbage, do the dishes. Everything needed to keep stuff neat and organized. But my desk is a mess, and that is an extension of my head. That's a mess too. I need to leave myself notes to not forget things. I make lists when running to the store for anything more than 3 items. And even on three I will forget something. No matter how important something is, I will forget about it. My brain just works that way. I remember that Lee Majors and Farrah Fawcett were once married. Why? 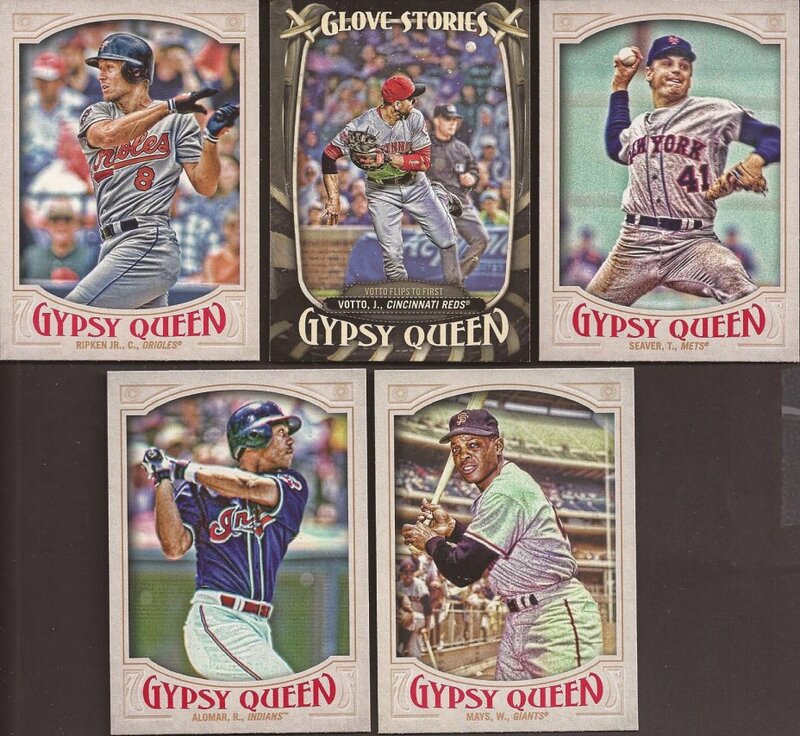 Why can't I replace that useless bit of info with something like which short prints I need for 2013 Gypsy Queen. So what that a rat can tread water for 3 days and fit through a hole the size of a quarter. 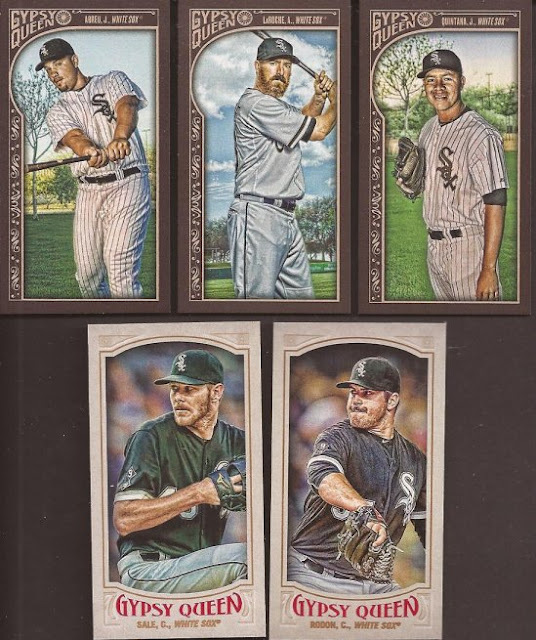 I still need like a dozen 2015 A&G base cards. Or maybe more - I can't remember off the top of my head. So I make lists. And when it comes to lists here, people look at them. And I can mark off numbers and my lists get smaller. Adam from Addiction as Therapy helps a lot with my lists. I like that he helps with SPs. Short prints are the bane to set collectors. I don't aggressively go after them, but the part of my mind next to the memory of my home phone number when I was eight (312-389-9551) needs to complete the sets. So I work on them. Adam also likes to fill other White Sox needs, and that's a good thing. Though, I am hoping I forget that LaRoche ever wore black. Just like I hope to forget David Wells, Bartolo Colon, Jose Canceso and Manny Ramirez ever wore it too. Maybe there is something more I can learn about Farrah Fawcett. Having a messy desk like that would drive my wife insane. That's a nice group of GQ cards as well. Speaking of packages, did you get the one I sent you? 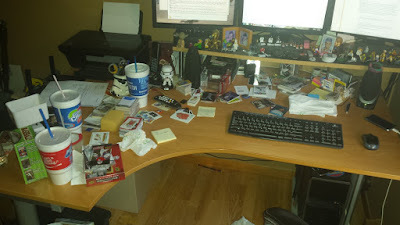 I am lucky (I guess) that my wife has as much trouble keeping her desk clean as I do with mine. It is often hard to find things, but at least she can't harass me about my mess. Yes I did. In the queue. It almost made it in this posts, but I have "lists" stuck in my head. I should have done "The Two Adams". Your mailer was sweet, though. I'm the same way. My desk (actually a fold up card table) is significantly worse though. A large part of why I started Cardboard History was so I could get stuff published before I forgot it.